Following a frenzied campaign of harassment by pro-apartheid journalists, the Israeli ambassador and the U.S. ambassador to Germany (infamous for his connection to far-right groups), Berlin officials declared on Friday night, 15 March, that Palestinian former prisoner and renowned activist Rasmea Odeh‘s visa would be cancelled and that she was prohibited from political activity. International solidarity is critical at this time. Please send statements of support for Rasmea Odeh to samidoun@samidoun.net. Supporters of the AfD, the most far-right party in Germany, deeply engaged in anti-Muslim, racist rhetoric and with a long history of welcoming Holocaust revisionists, demanded the cancellation of Rasmea’s speech and the revocation of her visa. Of course, the AfD – which aspires to emulate Israeli apartheid – was not alone, but was instead joined by Green politican Volker Beck, who has made his career by attacking Palestinians at the behest of the Israeli apartheid state and various Berlin city officials, including SPD mayor Michael Müller. An ongoing and severe harassment campaign directed at the venue that had been engaged to host the event. The hall was vandalized and the organization that owns it were subjected to numerous threatening and harassing phone calls and demands. Despite multiple assurances by police that the event could indeed go forward, Rasmea was pulled aside by police on her way to deliver her speech about Palestinian women in the struggle for liberation. Hundreds of police surrounded the venue, while around 15 pro-apartheid, Zionist counterprotesters carried Israeli flags. 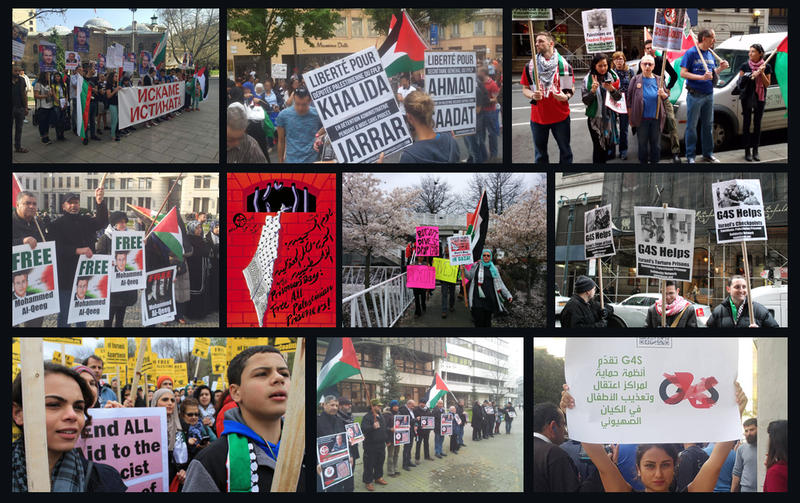 At the same time, around 150 supporters of justice in Palestine gathered outside the venue to hear the planned speeches of Rasmea Odeh and Dareen Tatour. Rasmea was surrounded by police and delivered a stack of documents in German declaring that her visa had been cancelled. These documents were replete with allegations that had been apparently taken fully from scurrilous and inaccurate right-wing media reports as a justification to force her to leave the country. Police then followed Rasmea kilometers away, demanding that she move down the street, leave another cafe in pouring rain, threatening her with arrest if she did not continue to move toward the east side of the city, even long after she had already left the venue for the event. Pressure tactics, intimidation and repression have been used to compel multiple venues to cancel events featuring Palestinian speakers, most notably officially-supported threats to cut the funding of an Iranian community center if it allowed an event with Manal Tamimi to move forward in September 2018. However, this comes hand in hand with cancellation of musical events for bands that support BDS, censorship of DJs for Palestine and pressure on venues and universities to cancel lectures and events about any aspect of Palestinian rights and existence. Palestinian and non-Palestinian women who participated in the Women’s March in Berlin were vilified in person and on social media for carrying signs recognizing that Palestine is a feminist issue. Rasmea Odeh was subjected to repeated and unsubstantiated allegations of “anti-Semitism,” which media organizations did not even attempt to justify except through the use of the “terrorist” label. Not one of the articles using this label could point to a single anti-Semitic statement, message or belief on Rasmea’s part; her commitment to the liberation of Palestine was deemed sufficient to make this allegation. This was clearly a racist attack on the right of a Palestinian woman to speak and the right of her audience to hear her. Through her life, she has been subject to intense state violence: sexual assault, torture, imprisonment, imprisonment again, deportation. The stripping of her visa is only the latest example of state violence directed against Rasmea Odeh in an attempt to block her message from being heard, a message that has garnered her support from Angela Davis, Jewish Voice for Peace (US) and countless supporters of justice worldwide. It should be noted that following the demonstration, which was enthusiastic, well-attended and led by women and youth, participants – particularly young Palestinians – were later followed by police and questioned about chants at the demonstration (particularly those challenging German foreign policy) and their relationship with Rasmea, even hours after the event had ended. This is an attempt to intimidate young people from being involved in the movement for justice in Palestine. We urge people of conscience around the world to support justice for Rasmea Odeh and justice for Palestine. We will be issuing urgent calls for additional actions in the coming days. Your solidarity statements and messages are important in making clear that the world rejects the actions of the German, U.S. and Israeli governments to silence Rasmea Odeh and instead stands with Palestinian women and the Palestinian people in their quest for liberation. For people in Berlin: we urge all to attend today’s demonstration, Saturday, 16 March at 3 pm at Hermannplatz in support of all revolutionary prisoners – including Palestinian prisoners struggling for freedom.